What are Cryoconite holes ? The glacier has long been believied to be an almost non-biological environment. However, recently, various cold-tolerant animals and micro-plants which spend their entire lives in the glacier were discovered. Our studies aim to clarify the eco-system of glaciers and relationship between organisms and glacier environment. Here we introduce the organisms on glaciers with pictures. There are a lot of beautiful organisms ! You can see QuickTime Movies of the copepods and the midge of a Himalayan glacier. In glaciers, there are plants (producers), animals (cunsumers) and bacteria (decomposers). They form a close and simple eco-system in the glaciers. Ice cores from glaciers are sources of ancient climete infomation. We are trying to analysis the ice cores with the glacier organisms such as algae and bacteria. The analysis would give us new informations of the past environment. The snow algae play an important role in melting process of the glaciers; they accelerated glacier melting and affected glacial mass balance by forming dark-colored materials (cryoconite) on the glaciers and reducing albedo. Cryoconite holes are tiny water-filled depression on glacier surface. They are suitable habitat for the glacier organisms. 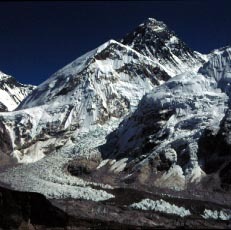 In Himalayan region there are many debris-covered glaciers with rock debris covering the ablation area. In this type of glaciers the habitats of the glacier organisms are the supraglacial lakes and englacieal melt water channel. Reports and plans of recent field work of glacier biology. ■Abstracts of graduate thesis of this lab. If you want know about glaciology, biology, or japanese activities, more.